Who, ultimately, is the true hero of Game of Thrones? I have a controversial offering to put forward, and it’s none of the usual candidates. Indeed, all those other characters we’ve been following might turn out to be the bad guys after all. Yes, even handsome Jon Snow and the pretty blonde with the dragons. Because the hero I have in mind brings messianic hope to the world of Westeros. Like certain other saviours I could mention, he possesses the ability to raise the dead, Lazurus-like, back to life. Unlike the red witch and Beric Dondarrian, however, he is not picky and partial about who he revives. It’s not only the elites, the nobles, the ‘high’ folk that he reanimates. He saves the ordinary, the ugly, the maimed and rotting. More than that, he embraces true forgiveness. He gives breath back to his enemies, the soldiers who have fought against him only moments before. Who among us could be so merciful? Throughout the series we have seen the corruption, selfishness, callousness and violence of the world of men (and women too). This hero intends to sweep it away. Like all revolutions, it will bring immense change. It will be painful for many. 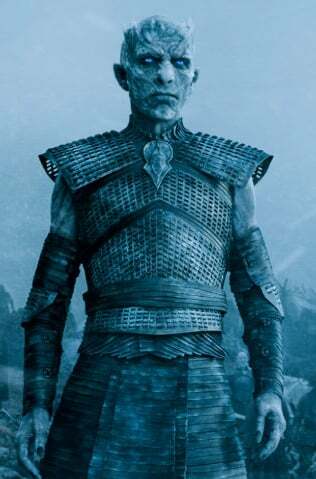 But if he is victorious, and at the end of it all the Night’s King purges the sins of humanity and sits upon the Iron Throne, it might just count as the most unlikely happy ending of all.